Since I’m a returning CHI Fellow for this school year, I wanted to do something quite different compared to my project from last school year. That previous project is called J-Skel and it is an online juvenile skeletal age estimator. That project focused more on the scientific side of things and was intended to be useful in an instruction or classroom setting or to be used as a reference for those who are estimating the age-at-death of juvenile skeletons. Although this is a useful tool for those in the field of human osteology, it is not as applicable to people in everyday life. For this year’s project, I wanted to tackle something both technically and culturally disparate, but first, a quick backstory to explain the impetus behind this new project. As a bioarchaeologist studying the ancient Maya at MSU, my advisor (Dr. Gabriel Wrobel) runs an ancient Maya Archaeology and Bioarchaeology Fieldschool every year called the Central Belize Archaeological Survey (or CBAS) in Central Belize, about 20 km south of the capital city of Belmopan. As a graduate student, I supervise excavations at the rockshelter sites we dig, as well as give lectures to the students and to the general public if they wish to attend. This year, I lectured over the final segment of Maya prehistory through the Colonial Period and ended with the Guatemalan Civil War that resulted in the genocide of Modern Maya people and the destruction of villages during the late 1970s and early 80s that resulted in the systematic targeting and death of over 200,000 indigenous Maya. As I gave this lecture, none of the students had ever heard of the Guatemalan genocide – also known as the Silent Holocaust. I found this to be somewhat of a disservice that none of them had ever been told about these events. It is because of this that I decided to do my project over the Silent Holocaust. I want this year’s project to be targeting a much wider audience than my last project and to also take on a cultural and civic justice direction. 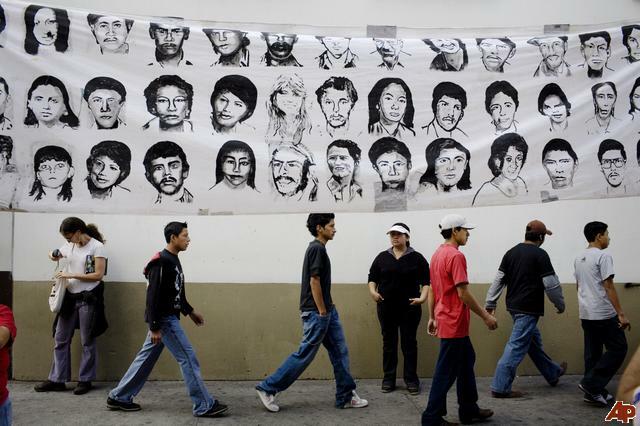 The Guatemalan Army systematically targeted and eliminated poor indigenous communities in the Guatemalan Highlands, where most of the Modern Maya reside today. Because these peoples mostly speak their own regional variations of Mayan languages and because they have been without a voice since the Spanish conquest in the 1500s, this ethnic cleansing has received far less attention than many others. Families were separated and murdered and entire villages were wiped off the map. It is because of this that I want to inform, or further inform, people about these atrocities that should not be silenced. In order to make this a project with more of a cultural impact, I plan on creating an interactive map that will allow users to track different journeys concerning the genocide, such as personal journeys or testimonies about fleeing and/or surviving, villages that were attacked, villages that were completely razed, events of social outcry in the major cities, modern-day efforts to commemorate and remember, etc. Although this is not an as well known series of events as other genocides such, as the Holocaust or the Massacre at Srebrenica, it has been heavily researched and there are data out there. I plan on using resources that are publicly available to craft and guide my website so as to be as effective and accurate as possible. Theoretically, this will not be as technically challenging as my last project (knock on wood) since at that time, I had little knowledge of how to code and interact with different coding languages. Though I’m still not an expert in any sense of the word on coding, I think this will be easier due to my gained knowledge from last year – a pleasantly challenging experience. However, I plan on using at least three new (for me) and different tools this year: Knight Lab StoryMap and Timeline as well as possibly Frappe in order to tell these narratives and help visualize the data. Part of this project isn’t just to inform the general public about events that should not be forgotten, but also to inform me as I will be adding in content as I discover it and I’m excited to go on that journey. I’m a Teaching Assistant for an Intro to Physical Anthropology course and during their last week of classes before the final, we have a lab activity set up for them where we bring in fossil hominin casts and ask them to look at the variation between them, their similarities, why they may or may not be directly within our evolutionary lines, etc. We do this by setting up stations around the lecture hall. As I was watching the students pick up the casts and comment on their weird appearances compared to a modern human skull, how their teeth are different, how their face shape is so unlike us, I realized that I have completely taken experiences like this for granted. Not all colleges or institutions have the funds to purchase these skull casts. They are surprisingly expensive (at least compared to what grad students are paid!) and I have placed some of them on my Christmas list because I cannot afford them, unfortunately to no avail. Greetings everyone! My name is Jack Biggs and if my name sounds familiar, that is because I was a CHI Fellow during the last academic year and was fortunate enough the be a returning Fellow for this year. 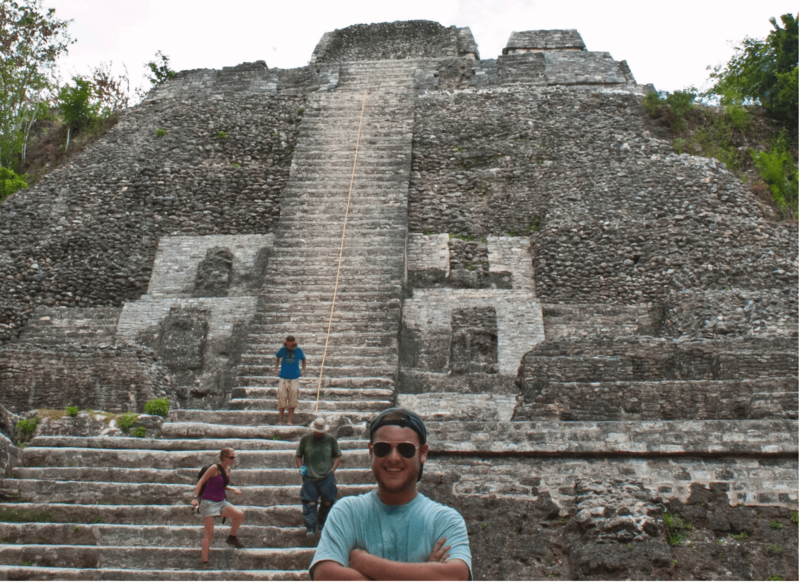 I am now a 4th year graduate student in the Department of Anthropology here at Michigan State University focusing on bioarchaeology of the ancient Maya. Although my research interests haven’t changed all that much since my first intro post last fall, I’ll go ahead and re-hash what Ispecifically study and some additions and changes since that last initial post. I am very proud to announce the launch of J-Skel: The Digital Ages Estimator of Subadult Skeletons at j-skel.matrix.msu.edu! I designed this website with the goal of]-o0 acquainting upper-level undergraduate students and early graduate students of physical anthropology and human osteology (or for anyone else just interested in bones) to aging methods of juvenile skeletons. Though this may seem like a morose topic, skeletal remains from juveniles are actually quite enlightening and can even give information as to the quality of life, area of origin, and migration patterns across time and space. All-in-all, juvenile remains are essential in reconstructing past populations. This can only be done by understanding how the body grows and develops during this time period, hence J-Skel. Data gathered for this project were from multiple resources that specialized on individual bones or elements and they aged over time during the life course. However, the majority of these projects were conducted by white European or European-American scholars on populations of similar demographics. Although there have been recent pushes to get more geographic and cultural populational studies rolling, the majority of data out there are on individuals of European descent. For this site, the skeletal regions I chose to group were the skull, thorax, pelvic girdle, upper limbs, and lower limbs. Each region/subpage is broken down by bone with general descriptions of age methods and age-related changes. Beside those are classes of buttons which correspond to different levels of fusion between bones. For example, the frontal bone (the forehead) is originally made up of two halves that fuse and become one single bone. The buttons beside the description would say: ‘unfused’ – for two separate halves, ‘fusing’ – one bone that is in the process of fusing the two bones, or ’completely fused’ – the two haves have become one with no remnants of the fusion line. Depending on which button you clicked per bony element, an appropriate age range would be generated and appear in a text box on the right side of the screen. Using the example above, if you have a specimen in front of you from a skeletal collection where the two frontal bones are in the process of fusing, by clicking on the button labeled “Fusing”, the text box to the right would reveal: “Between 2 and 4 years old”. This process is the same for all of the bones that I used for this project. However, not every bone or bone type in the body is used for aging one the website. Some bones are much better than others to use for aging, so those are the ones that were selected. 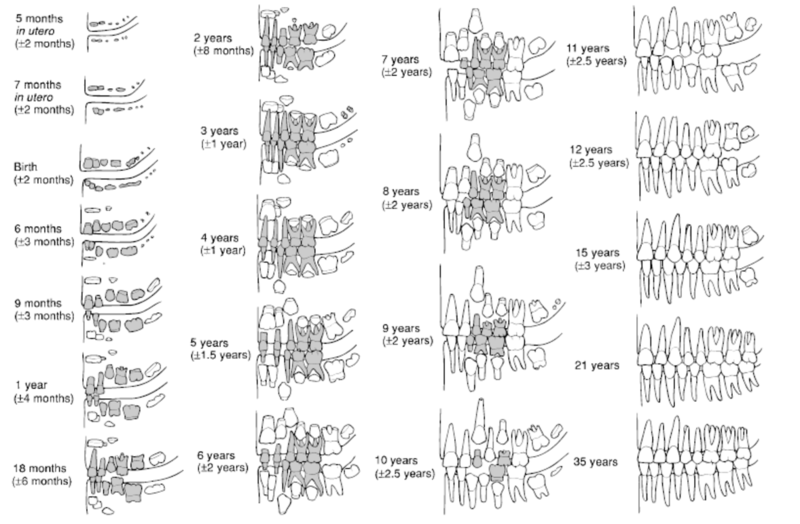 One aspect of the site that I plan to work on over the summer is to include a section over aging using dentition. The teeth form and erupt (protrude from the bone) in a very particular order and on a strict schedule such that teeth can greatly increase accuracy in age estimations. The reason they have not been included in the site right now is due to a function of time for research. Teeth are incredibly complicated structures and the time it would have taken to get all of the information gathered and synthesized would have prevented me from launching the website on time, so be on the lookout for that section to pop up later this summer! I hope you find this tool as useful, interesting, and informative as it was for me to create (both content-wise and from a web designer point-of-view). This subject is one that may on the surface seem eerie or creepy, but recognizing the value of how infants, children, and teenagers make sense of- and are affected by the world around them helps us understand cultural processes and mechanisms of society. This tool is just one way of starting to address these interests, so I hope you enjoy the website and learn something new! The past few months have been incredibly frustrating as I made little headway in creating my clickable SVG of a juvenile skeleton using Raphaël.js. By clicking on a certain bone, the user would be taken to another page corresponding to age estimation methods for that bone and use the features specified to come up with an estimated age. Since clickable SVGs are created as paths that have beginnings and endings, each path corresponds to either a single bone or a closed path on a bone. As a result, this means that each bone would have its own link, so to simplify the process, entire regions of bones will be selected at once no matter which bone you click on. The skeletal regions have been split up according to standard anatomical regions: skull, thorax (ribs, vertebrae, sternum), upper limbs (hands, forearms, arms, clavicles, scapulae), pelvic girdle (pelvis and sacrum), and lower limbs. Although I appeared to have the correct links and format for Raphaël.js, nothing would work and nothing showed up on my webpage. Fortunately, I think I have found a way around that. Instead of linking raphaël.js and my skeletal SVG data paths from separate files, I was able to successfully link embed the SVG data directly into the body of my html page without even using raphaël.js. Downside is that this makes the code on my html page much longer and look less clean. However, it correctly links and works and so I’m happy to have slightly less concise code if it means that one of the main functions will work! As an example, I’ve copied and pasted my example here (https://jabiggs13.github.io/skull-test/). For right now, the outlines of the skeleton are linked to another website so when you click on a feature, it takes you to eskeletons.org – a website created by the Department of Anthropology at the University of Texas at Austin dedicated to teaching basic human skeletal anatomy as well as focusing on other primate skeletal morphology. (This was honestly the first site that popped in my head when testing to see if the linking feature of my SVG worked). As it stands right now, there is a major problem th at I had not anticipated. 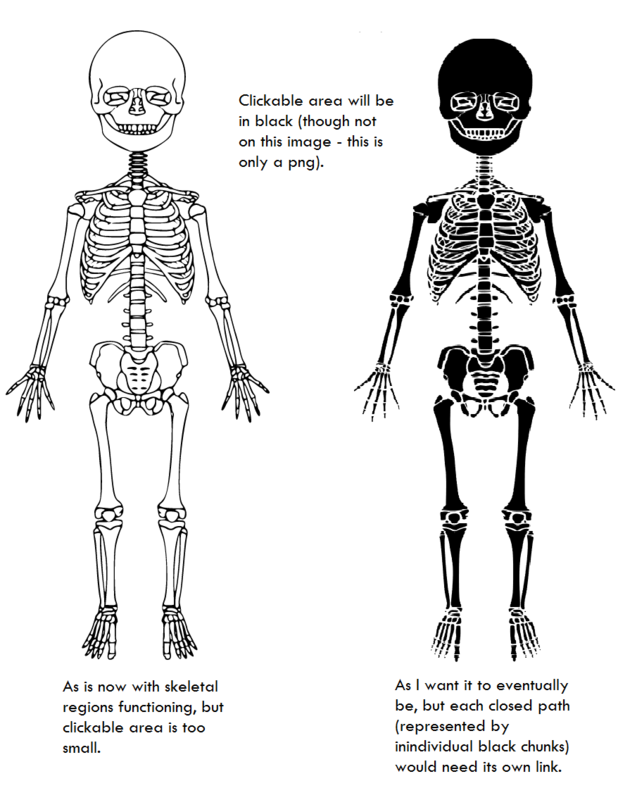 The only portion of the skeleton that is truly clickable is the outline of each bone, not the actual bone itself. This was not a problem I had thought about until I finally got everything working. My solution to this problem is basically messing with the original paths and outlines of the SVG so that the space between the outline is filled in and is the actual clickable content. With this process, there are now exponentially more paths, meaning that there are way more individual closed loops that would require their own separate links as the program (Inkscape – free!) is no longer recognizing my grouped regions (i.e. it is not recognizing the ‘ribcage’ but each individual rib or piece of rib that is its own separate loop). Though less than ideal, this may just be the nature of the beast so that each individual path would then have to have its own link, making my skeletal regions less useful as an overarching theme. Despite this newest hiccup, I am incredibly relieved to be past this one major hurdle do I can now focus on each of the individual ageing methods that will link up to specific bones. Apologies for my tardiness in posting! It’s been an incredibly hectic semester so far and time keeps on slipping away! Since my project is focused on subadult skeletal age estimation, I’ve really started going through the literature and publications over the subject. On one hand, this is a great way for me to conduct in-depth literature reviews for my methods section of my comprehensive exams and prepare for my dissertation since I’m focusing on the growth and development of ancient Maya subadults and how social, environmental, and biological stressors affect those processes. On the other hand, I’ve been running into a few academically-related brick walls. One common thread I’ve found throughout most of the literature is that there really is no single-agreed upon method for most of the transitional age-related changes for any single bone or bone element. Academia, especially Victorian and early 20th century academia when many of these studies originally took place, is full of researchers and their own opinions or just blasting other scholars’ methods. Additionally, the racist roots of physical anthropology focused on non-white populations as a curiosity while only conducting comprehensive and in-depth studies of white European or American populations. This is an unfortunate trend that extended embarrassingly far into the 20th century and was not until post-WWII that things began to change. An additional unwanted event occurred in which I accidentally discovered that another researcher is using the title ‘OSSA’ as well for his osteological software that statistically estimates ancestry. It has not yet been published and is still in its beta test phase which is why nothing originally came up in my search for anyone else using that acronym. Although I think I may technically finish my website before him and could thus use the name, this researcher is on my dissertation committee and I felt it wisest not to make them mad! So for right now, the working title of the project is ‘Fontanelle’ in reference to the spaces on the cranium of incomplete closure on infants. As it gets later and later into the semester, I’ve started trying to put together ideas for my CHI project. While I’ve been thinking about what specifically I would like to do, there was one notion that kept popping up in my head: make accessible, usable, and relevant for other people, not just myself. Sometimes as researchers, we get so buried in our niche fields and specialties that although we view our own research as interesting and significant, others obviously do not. I feel that this is especially true in anthropology and archaeology given how technological advances of the past few decades have allowed us to create even more specialized areas of research. Though these new methods can greatly add to our understanding of how populations of the past interacted and moved within, through, and around cultural and physical landscapes, we must be careful not to disenfranchise other researchers in the process. As I discussed in my previous post, I study subadults’ social identities as well as skeletal growth and development within Late Classic Maya society. To me, this is absolutely fascinating and necessary for understanding the ancient Maya. To other bioarchaeologists, archaeologists, or even the general public, it is not, just in the way that other people put emphasis on their research as an essential tenet of their field. In other words, not everyone places the same level of importance on specific aspects of research as you do. The specialization of your methods and research should be approached very cautiously so as not to make you too generalized on the one hand, or too specialized on the other. This is what I want to avoid while thinking about my CHI project. If it’s too generalized, it will just become lost in the sea of similar online tools. If too specific, then it has the potential to be relevant to a very small number of people and therefore useless to most archaeologists, bioarchaeologists, and students of human osteology my target audience. Taking all of this into consideration, I’ve been thinking about how to effectively integrate my specific research into a much broader capacity for my CHI project that would be useful for people other than those who study ancient Maya childhood (of which there are very few). However, since I do focus on skeletal growth and development I feel that I can use that knowledge and hopefully translate it into a tool that is useful and educational. My most likely idea would be to create some sort of minimally interactive repository for estimating the age of subadult skeletal remains. Subadult skeletal remains are much easier from which to obtain an age-at-death due to incredibly well-documented processes that the body undergoes during the first 18-20 years of life. These mainly include the incredibly specific timing of teething events (down to a few-month window) and tracking growth plate fusion. In adults, it is much more difficult to estimate age-at-death since the body has stopped growing and you are then looking at degenerative changes over time which are affected by health, occupation, status, etc. Although studies over estimating age are numerous, there is not a dedicated repository focusing on subadult remains. I feel it would be beneficial to create some kind of age estimator where the user would indicate what levels or stages of growth and development an certain bone presents (that is being physically studied by the user) and the website would crank out an estimated age range based on the most updated or accepted age-estimation studies. Ideally this would be most heavily geared towards students but also used by other researchers as a way to quickly estimate the age based on multiple bones which otherwise would cause them to wade through different publications. My goal is for this to potentially be used as both a learning interactive experience and a tool for the user. This might sound all well and dandy, but why is estimating age-at-death so important? Estimating the age-at-death of skeletal remains is one of the first tasks when encountering these materials, be they modern or archaeological. Understanding the age distribution of a past population is invaluable to how you interpret that population. Different cultural, biological, and environmental factors, all of which affect one another, will determine what the age distributions are within that population. For an archaeologist, this helps reconstruct who this population was and how they functioned and interacted. For example, normal age distributions for the ancient Maya show high infant mortality rates, low death rates among young adults, but higher death rates among older adults. Compare this to the plague pits of Europe during the Black Death – everyone was affected almost equally so the age distribution is more or less even. Since we are able to more accurately determine the ages of subadults, researchers can ask age-specific questions and better understand what kind of stresses juveniles and infants are experiencing at what specific ages in their childhood. Overall, understanding the age distribution is essential to understanding the people themselves. Hi everyone! So I tried to post my introduction blog a while back but I guess I somehow messed it up and it never appeared so this is going to be a double blog today. My name is Jack Biggs and I am a 3rd year PhD candidate in the Department of Anthropology. My focus is in the bioarchaeology of the ancient Maya in Central America, primarily within the Late and Terminal Classic Periods (about AD 250 to 950). I will hopefully finish up my coursework next spring and start working on my dissertation proposal. Although not entirely set in stone, my (hopeful) dissertation research will focus on the skeletal biology and cultural identities of subadults in Late Classic and Terminal Classic ancient Maya society. Specifically, I am interested in how the growth and development of the skeleton is affected by cultural, biological, and environmental stressors and surroundings. By looking at how these factors affected infants and children, I hope to analyze differences in how society viewed subadults, how they were treated compared to adults, and by proxy, how we can interpret maternal health via infant remains. Additionally, most of my research and the collections from which I will collect data come from central Belize. The skeletal remains from these sites are predominantly from cave and rockshelter contexts which were often used as mortuary spaces. The comparison between these site types and possibly between more urban centers (data and preservation willing!) will add an interesting extra layer to my overall research goals. I have yet to decide exactly what I’m going to do for my CHI project, but I’m excited to figure it out and be a part of this program! So like I said earlier, I’ll also be posting another entry today. Similar to what Autumn posted previously, I will be focusing on photogrammetry as well. In the Maya Bioarchaeology Lab here at Michigan State, we have been using photogrammetry for about a year. Instead of cultural artifacts, we have been making models of the skeletal remains that were excavated from a number of sites in central Belize. For me, one of the most important aspects of creating these digital models is to preserve the bones and the data that they give. The remains are incredibly fragile and by making models of them, we’re able to preserve them digitally and slow down the rate at which they break down due to handling. However, the data they give us is also incredibly valuable. Within the programs available to create and modify the models, you can also take measurements in the 3D space. 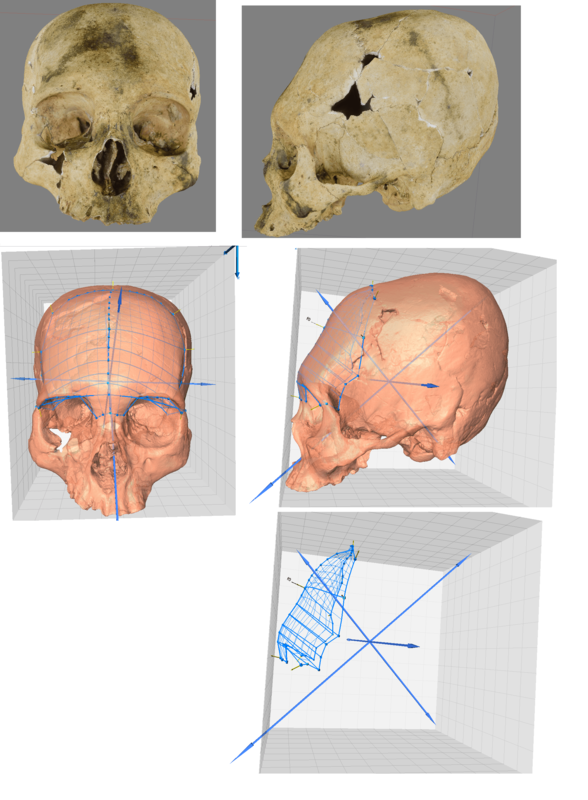 This is incredibly useful for bioarchaeologists since discrete skeletal differences between groups or populations can be left in the architecture of the bone, especially on the skull. Additionally, we are trying to use photogrammetry to digitally reconstruct bones that may otherwise may be too fragmentary or may be missing pieces that connect other parts of the bone. Again, this can give us the ability to collect data from places where it was previously unavailable. Even though we are still working on the kinks and focusing on our methodology at this point, it is incredibly exciting to see the potential that photogrammetry has for the future of archaeology and bioarchaeology.